The United States is the only industrialized country in the world that has no minimum for paid recreation/vacation leave, as mandated by the federal government. This means that it is up to employers to dictate how many (if any) paid vacation days an employee can take. Opinions on this reality aside, this leaves more and more Americans to search for ways to stretch their few precious vacation days to make the most out of them. Though international travel to destinations such as Mexico, Central America, and Europe are becoming cheaper by the week, most Americans who do take vacations choose to remain stateside. And who can blame them? If you know you only have three or four days to squeeze in some R ‘n’ R (that’s rest and relaxation, but finding time for rock ‘n’ roll is just fine in our book), wouldn’t you choose to spend more time in a place rather than eight-plus hours on a plane? But, as it can be hard to fully embrace the latter part of R ‘n’ R in a few short days, more and more Americans are opting for packing in adventure, excitement, and adrenaline-pumping activities. And what better way to get your energetic juice flowing than booking adventure tours, renting a jet ski, or parasailing high above the coastal and inland waters of Key Largo? If you have three to four days (or, even if you have fewer! ), Keys Skis knows how to help you make the most of your long weekend — we’ve even put together a sample itinerary for your long weekend in Key Largo to help get you motivated. 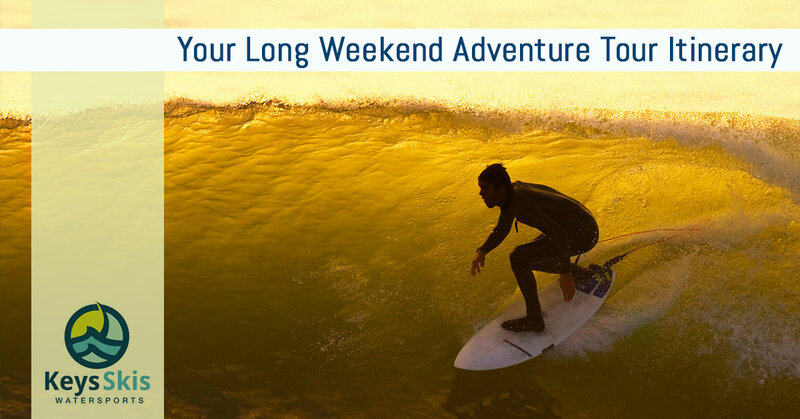 Ready to learn more about how to make an action-packed long weekend totally feasible? Take a look below. Whether you’re driving into Key Largo or flying into MIA or FLL and taking a short trek into town, you’re sure to be a bit tired from your travels. As this is often the case, you’re likely to want to immediately settle into your hotel or condo, hit the restaurants and bars, and then call it a night. While this is a fine way to go about your first day in Key Largo, we highly recommend taking the time to get to know the town a bit. And what better way to do that than by booking a parasailing tour? While this may not be the most traditional way to get to know a town, it’s an excellent way to cap off your trip into town. Getting a bird’s eye view of Key Largo is not only breathtaking, but it is a great, outside-the-box way to find spots you’d like to check out; you may not be able to read street signs, but you’ll get a great idea of where the action is — and where the more low key spots are located. Not only is parasailing one of the best ways to see Key Largo and the beautiful waters surrounding it, but it’s also a great way to spend time talking with your travel partner about what to do, where to go, and when to work in that elusive rest and relaxation we hear so much about. Besides, after hours in the car or on a plane, parasailing gives both your mind and body the chance to unwind and just be for a moment, experiencing all of the spectacular visuals Key Largo offers. If you’re planning an action-packed weekend, do yourself a favor and kick it off on a high note with parasailing. After your day of parasailing and a slow morning at one of Key Largo’s famed cafes or restaurants, it’s time to kick it into high gear. How, you ask? Jet skis, of course! With so much sea surrounding Key Largo, it’d be a shame to come all this way and not take advantage of the open seas and inland waterways. When you book a jet ski rental with Keys Skis, you’ll get a first-hand look into life in the Keys; whether you book a one- or two-hour jet ski rental, you’ll have ample opportunity to get up close and personal with the sea, shore, and sun. Just like with parasailing, jet ski rental gives you the chance to explore the coast and inland waterways at your own pace. (Most people choose a breakneck pace because, well, it’s a jet ski, but if you’re feeling a slower day, your jet ski can deliver a more tempered speed). Whether you want to share a jet ski with your travel partner or you’re looking to speed along solo, Keys Skis has you covered. Not all who come to Key Largo are looking to spend all of their hours on and over the sea. By now, you’ll probably feel fairly confident with areas of Key Largo, but for a leisurely look at the rest of the town, bike rental is the way to go. With so many cute cafes, restaurants, bars, shops, and sites in such a small area, bikes are a great way to really dig into the town. Perfect for starting your day off at one of the town’s many breakfast eateries and cafes, your bike rental is your low-stress way to bop about the town, rather than driving your car the half mile it takes to get to your destination. And, after that long drive into town, who wants to spend more time in a car than need be? Give your legs and lungs a mini workout and explore Key Largo like a local. After three days of exploring Key Largo, it’s time to tackle the water at a closer level. We’re talking about kayak rental, here. With options for one or two people per kayak, rowing your way around the coast or inland waterways is a great way to cap off your stay in Key Largo. By now, you’ve had the chance to explore the town by air, water, and land, and kayak exploration is a great combination of the latter two. When you paddle your way around Key Largo, you’ll get a chance to explore much of the flora that adorns the waterways — and you might just get to say hello to one or two of Key Largo’s friendly sea animals who are used to hanging out with humans as they explore the area. Want to make your last day in Key Largo the most leisurely? We highly recommend our two-hour kayak rental because, trust us: once you begin gliding across the glassy waters of Key Largo, you won’t want to coast back to shore anytime soon. With so many places to see in such a small area, Keys Skis is proud to say that we offer the best methods for exploring our lovely little town. Whether you’re looking for high-flying fun, adrenaline-inducing speed, leisurely paddles around town, or looking to take it slow on the sea, Keys Skis can help make your long weekend a hybrid of both rest and excitement. Curious about any of our services we mentioned, or have questions for us? Don’t hesitate to get in touch with us today to begin planning your next adventure tour in Key Largo.